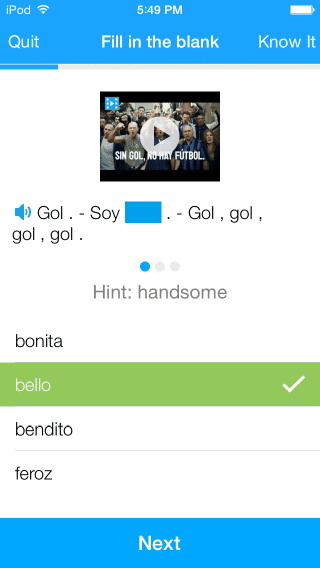 Teaching Spanish is fun and rewarding, but it’s not without its difficult moments. The pressure is always on to keep lessons fresh and exciting and to ensure that students are motivated and awake! It can provide Spanish teachers with a treasure trove of language learning riches to help breathe new life into the classroom. For example, your students can check out great YouTube channels for learning Spanish, as well as fantastic Spanish podcasts. 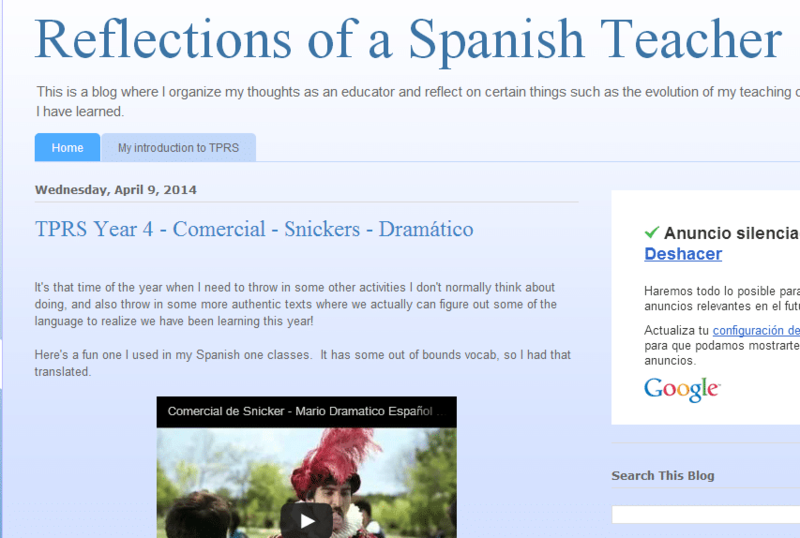 And of course, there are Spanish teacher blogs. 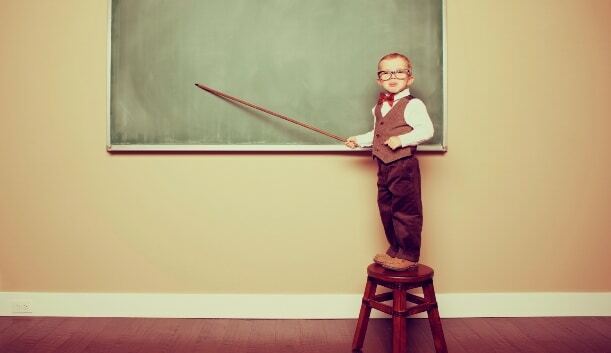 For your convenience, we’ve compiled a list of 13 truly great Spanish teacher blogs. These are outstanding sites where teachers share their experiences and discuss and review lesson plans, tools and resources. 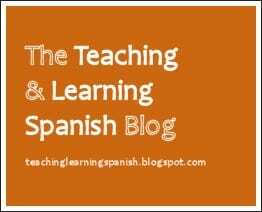 We are not claiming this is the definitive guide to Spanish teacher blogs. Lists such as these are subjective by their very nature, reflecting the viewpoints, tastes and experiences of the compilers. However, out of the many blogs we have come across during our Internet travels these are the ones we appreciate the most. Our sole aim in assembling this list is to provide you the Spanish teacher with some pointers towards useful material that we think will be of great value to you. 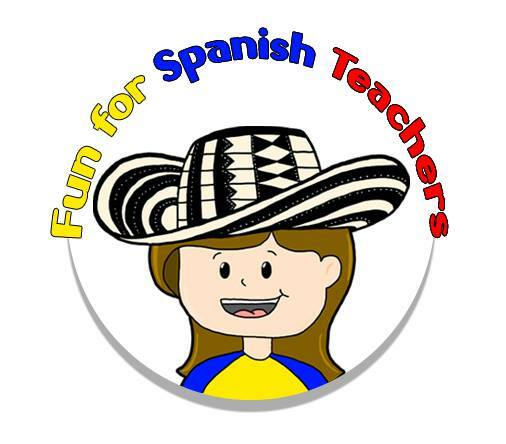 Fun for Spanish Teachers is bursting with plenty of songs, games and ideas for elementary Spanish teachers to fill their classrooms with lessons that are as fun as they are educational. 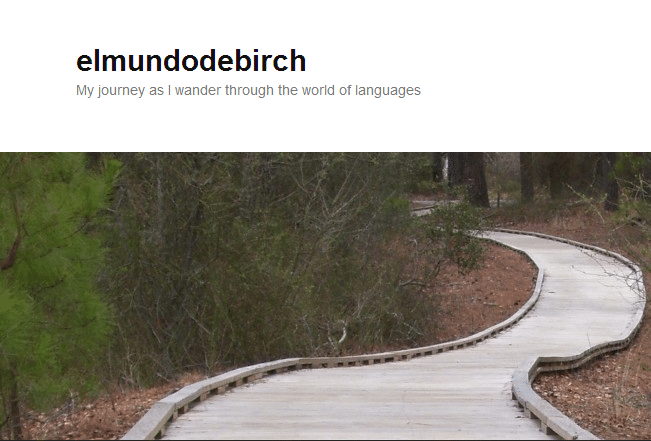 The blog is written by Carolina, the founder of 1-2-3 Spanish, an early language program designed to teach children Spanish. 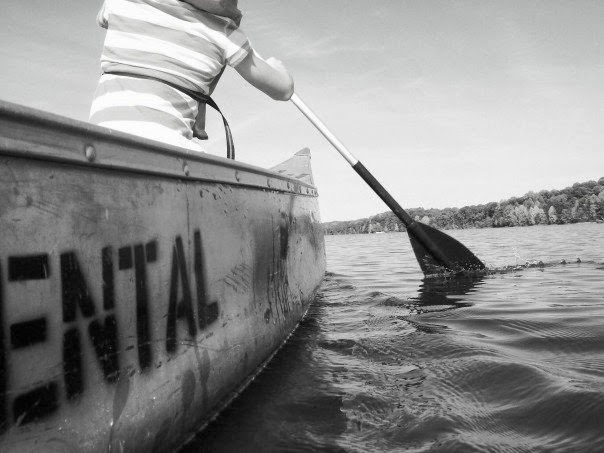 The posts are very engaging and a pleasing mix of text, videos, photos and graphics. For the teacher who may be stuck for ideas or who just wants to try something new, there is much on offer with a resource-rich reservoir of material that goes back to 2010. Carolina also provides pages of links to free resources for teaching Spanish in elementary school. 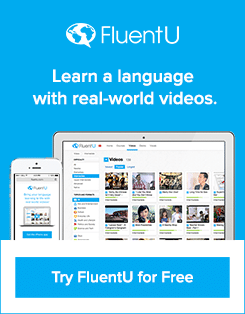 The FluentU Spanish Educator blog is devoted to featuring all the best and brightest resources online and in print for anyone teaching the Spanish language to others. It’s full of recommended games, songs, activities, exercises, and strategies for both teaching and learning. 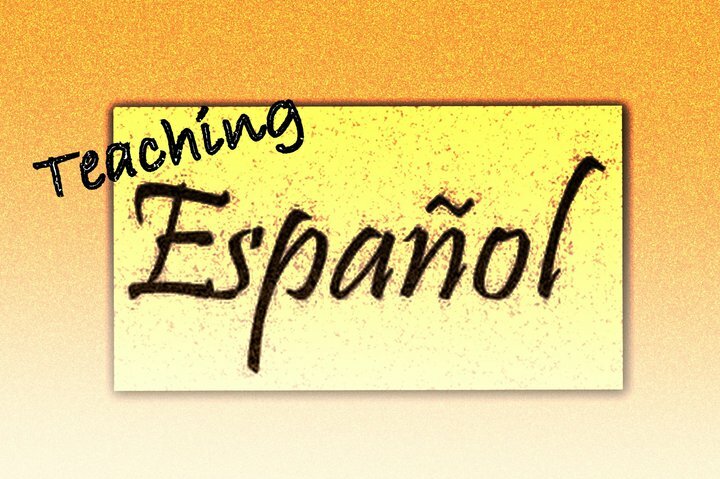 The articles on this page are contributed by a host of high-caliber, experienced Spanish teachers who absolutely love what they do—and they bring their lifelong passion to their work and their writing. 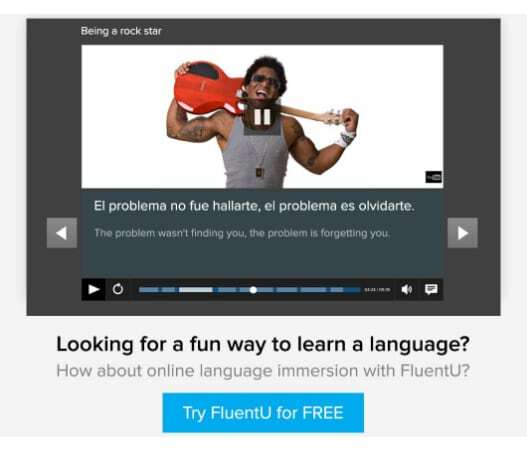 Spanish teachers love FluentU for their lessons because FluentU takes real-world videos like music videos, commercials, news and inspiring talks and turns them into Spanish learning experiences. 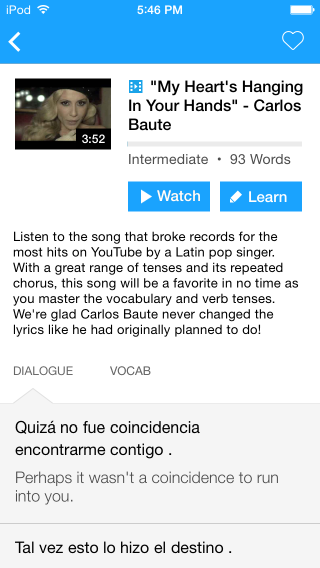 Start using FluentU on the website with your computer or tablet or, better yet, download the FluentU App from the iTunes store or from Google Play and access the latest material directly on your iOS and Android devices. Teaching Spanish with Comprehensible Input features the contributions of three Spanish teachers. They write about teaching methods, lesson plans and resources they employ, noting good and bad points and how and why they are useful. Within this structure are suggestions for lessons and activities, some with step by step guides. Each post is well written, nicely structured and engrossing. Some of the articles provide links to teaching resources or to material that can be downloaded for free. 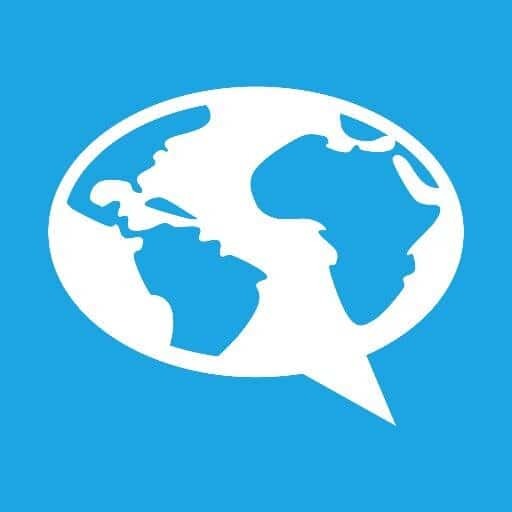 This is a great site for teachers who want to pick up useful insights from shared experiences. Technology is transforming the language learning landscape, but technophobes have no need to run for the hills. Not when you have this highly informative series of articles on the use of technology for learning languages. They are written by Lisa Stevens, a primary language educator and consultant who specializes in primary language teaching, using ICT to boost learning and Apple in the classroom. Her ¡Vámonos! blog covers talks and presentations she has given as well as learning points from conferences she has attended. As with any good blog worth its salt, Lisa’s posts include links to other useful resources, external as well as her own, such as slideshows. Teachers who want to know more about technology as a Spanish language learning tool will find much of value in ¡Vámonos! 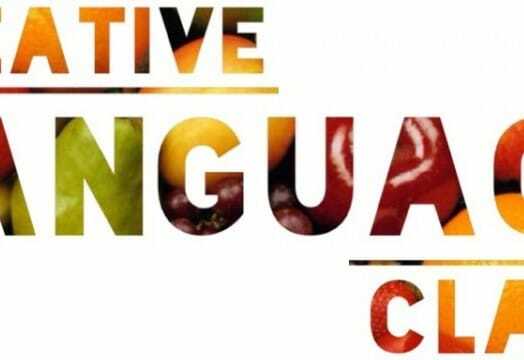 From tips to student teachers to reflections on classroom experiences, Creative Language Class is a useful addition to the language teachers’ blogosphere, written by two US-based teachers. Between them they have chalked up almost 20 years of language teaching experience. Posts are grouped by categories such as homework, organization, planning, teacher problems, vocabulary building and presentational speaking. They are well laid out, make good use of images and are written in a light, informal and engaging style. There is a lot of good material and ideas here from two dedicated professionals who are currently out there working the classroom front lines. 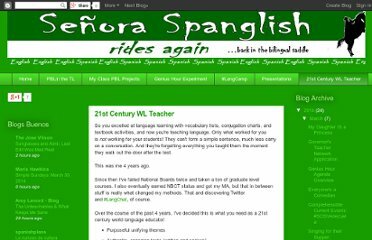 As the title suggests, this comprehensive blog is suitable for both teachers and students of Spanish. It highlights a collection of resources that are the subject of a comprehensive series of insightful and helpful articles. They are written by Karen who has been studying Spanish since high school, has taught the language in preschool and is currently teaching Spanish to her elementary-age children. So she has vast experience which she uses to find, explore, review and explain language learning and language teaching tools. The site also has a links section that is continually reviewed and updated. There are plenty of goodies here for the Spanish language teacher who wants to know which books, CDs, DVDs and other materials to use in the classroom. This informative site searches the online and offline world for useful learning aids to review and recommended. Blog posts also cover a variety of other topics including lesson plans, songs, curriculum reviews and learning strategies such as periodic repetition. Along the way there are links to free resources on the Internet and some downloadable extras such as free worksheets. 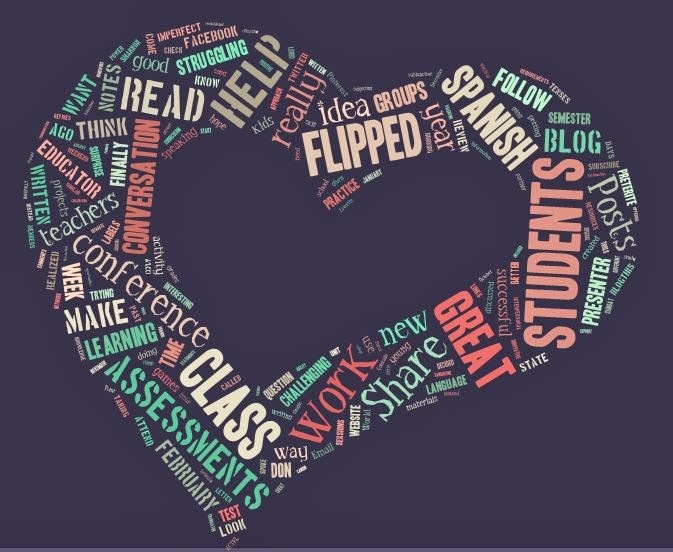 Flipping My Spanish Classroom is an enlightening blog by run a high school Spanish teacher in Elizabeth, Colorado. It is part resource guide and part forum to share ideas and experiences about the concept of the flipped classroom in language learning. Some of the articles are quite lengthy, but they easily engage the reader and are cleanly broken up into distinct sections. Many attract a good selection of the comments. This is a dynamic blog with a good community of followers, and is suitable for any teacher who’s flipping or thinking about flipping their classroom. 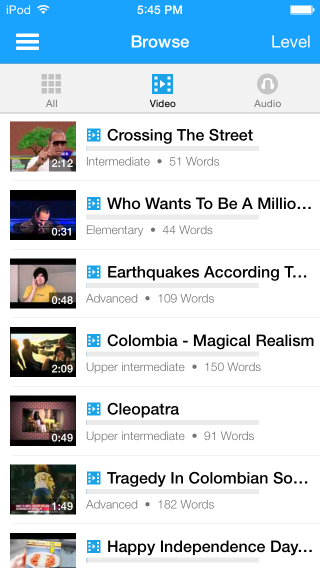 Occasionally, there are some nice additional touches such as student produced videos. 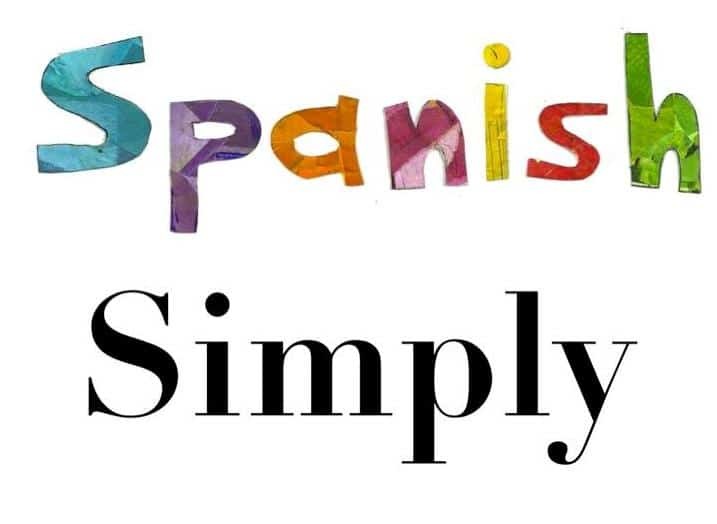 Helpful, informative and stimulating are just some of the ways to describe the excellent Spanish Simply blog. Run by a teacher of Pre-K through 4th grade students, the blog shares a plethora of classroom tried and tested teaching ideas. There are articles covering such topics as technology for language students, setting up an elementary Spanish library and teaching ideas. What comes through loud and clear is the author’s clear devotion to and passion for teaching Spanish. This all makes the posts stimulating food for thought. Señora Spanglish shares the ins and outs of various strategies, approaches, tools, resources and lessons plans. These are meaty blog posts that cover PBL (project-based learning) topics in some detail and they include plenty of how-tos. One of the stars of the site is the ‘My Class PBL Projects’ where the author discusses and assesses classroom-based projects. Lots of great plans and activities are featured here. 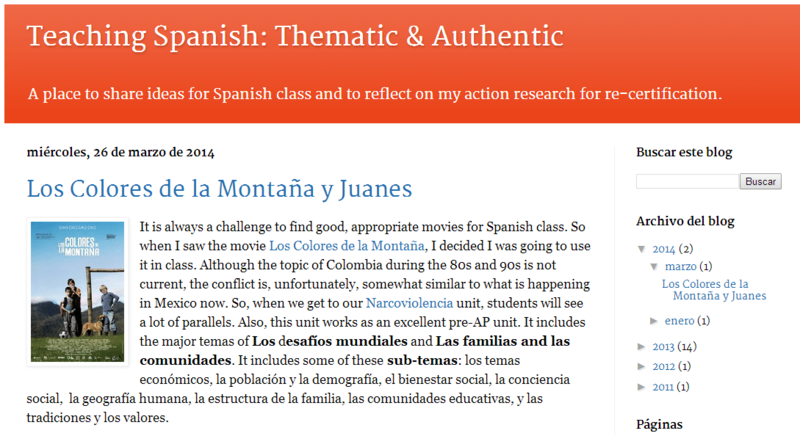 The author of this superlative blog brings more than 30 years of language teaching to the table, ranging from 7th grade through seniors, and Exploratory Spanish through Spanish V. The focus here is on sharing knowledge gleaned from personal classroom experiences of using tried and tested as well as new approaches. A vast range of topics is covered including grammar, reading comprehension, games, activities with music, performance based tasks and writing and speaking assessments. The articles are sprinkled with videos, pictures and links to useful resources such as lesson plans and other websites. Jeremy Jordan is a Spanish teacher who shares his classroom experiences as well as reflections on the evolution of his teaching, particularly related to Teaching Proficiency through Reading and Storytelling (TPRS). The astute observations and personal insights are a good resource to turn to time and again, whether you are just starting out or already have a few years of teaching under your belt. When the ideas bank is running on empty and you are looking for inspirational lessons and activities to enliven the classroom, take a look at Teaching Spanish: Thematic and Authentic. Kara Jacobs provides lots of details and reviews of resources and tools she regularly uses and new ones she comes across such as films, videos and websites. There is a lot of excellent material here, that’s well written with neatly organised sections and links. Many of the posts feature relevant videos.